AKM “Legend” Steel series laser tag gun is made based on the deactivated body. The body is made of metal, the forearm and stock are made from wood, the pistol grip and the magazine are made from look alike wood plastic. The basis of the optical system is a traditional «PBS-1» tube that is usually used for AK (Kalashnikov assault rifles) series game sets that allows you to confidently hit the target at a distance of 660 feet. 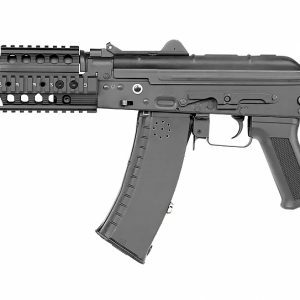 As a switching mechanism AKM laser tag gun uses an anti-vandal lock located on the rear side of the magazine. The power source is a lithium battery of 2,2 Ah capacity, that provides up to 30 hours of continuous operation.